Metal Building Company has repaired thousands of metal buildings since 1976. Metal building repair can include minor metal replacement or it may be fully repairing a damaged structure. We can match almost any metal profile. That includes Butler Buildings, American Buildings, Kirby Building Systems, Gulf States Manufacturers, CBC Steel, Nucor, and others. We build metal buildings from the ground up. We are fully familiar with the inter-working of your metal structure. We can repair damage caused by fire. We can make repairs to structural damage and damaged siding. Included could be Metal roofs, metal gutters, metal downspouts, damage to skylights, and more. We can handle any repairs your metal building needs. Are you are a building manager? Perhaps a property owner or general contractor? We work with everyone and can explain our process in detail to you. 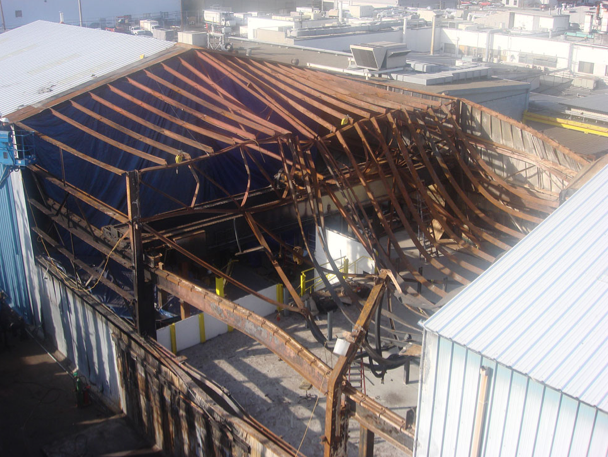 You will know exactly what to expect during the repair of your steel building. After we get an overall idea of the scope of your metal building repair needs, we get to work providing you with the option that best fits into your budget. This includes offering the latest in technology and industry standards. Our experienced project managers ensure that the project is completed on time and to your specifications. We have proved that we deliver on our promise to provide the best repair at the best price. Ready to receive a no obligation quote? Give us a call at 510-635-0111 or contact us here using our online form. We currently only service the greater bay area of California including San Francisco, San Jose, Oakland, Fremont, Sunnyvale, Santa Clara, and Hayward. In the northern part of the bay, we also service Santa Rosa, Napa, Sonoma, Concord, Vallejo, Fairfield, Sacramento, Stockton, and the surrounding areas. If you live in a city that is not mentioned that is close to one of these cities, we would also be able to provide steel building repair to you. We currently serve the entire Bay Area and Sacramento / Stockton areas and all major surrounding cities.